We have threatened to take a nap in a particularly inviting cheeseburger before. We have frequently threatened to take a nap in a particularly inviting bowl of macaroni and cheese. Or occasionally, to rest our head on the best-looking cheeseburger we've ever seen. Madrid-based designer Davidelfín has made these threats feel a litte more realistic with this Burger Duvet Cover. 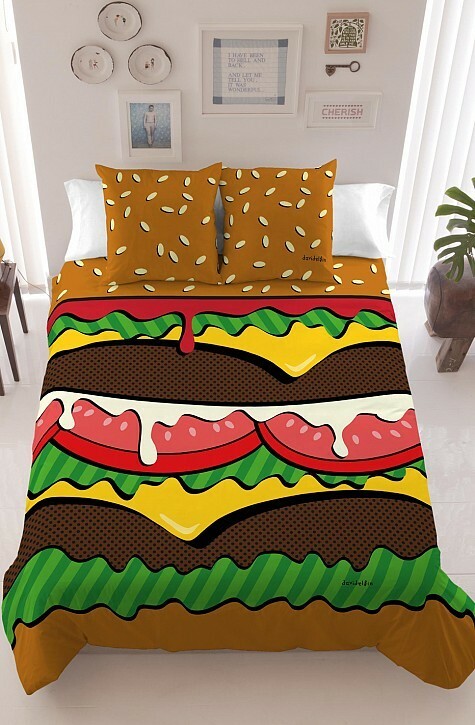 We might even say that this burger bedding beats the chocolate bar bedding set for our new favorite? We just really love cheeseburgers. If you know anyone who loves cheeseburgers so much they'd like to sleep in them every night, you can pick one of these up from Davidelfín for about $117. Okay, let's go find some cheeseburgers now.